It has only been two budget cycles since the Office of the Federal Chief Information Officer (OFCIO) at the White House Office of Management and Budget (OMB) changed the IT budgeting process to be based on Technology Business Management (TBM) methodology. TBM holds great promise for the management of technology throughout the Federal Government. However, this is a major change to CIO and CFO shops government-wide. Some agencies were able to make the transition with few bumps in the road while others, understandably, have much more work left to do. TBM Process: How well processes are integrated and streamlined across other organizations within the agency. In the coming weeks, we will publish detailed white papers on each level of the Maturity Model. We will provide criteria for evaluating the entities in each focus area, at each level of maturity, and recommend guidelines for how your agency can make improvements. 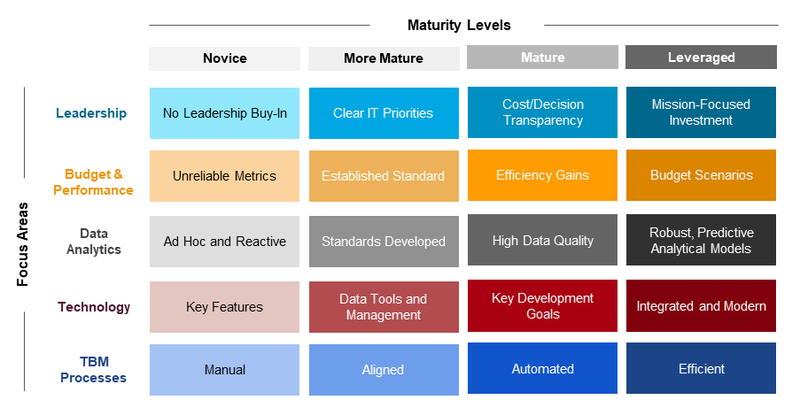 Using the Maturity Model and accompanying guidance on how to apply it will enable your agency to identify gaps in your metrics, connect common issues with effective solutions, create an actionable plan to achieve maturity, and track progress against your agency’s goals. Subscribe to TCG’s mailing list to have future publications about TBM and the Maturity Model sent to you directly.